Two fictional stories and two non-fiction texts to enthuse young readers at Turquoise Book Band 7, offering literary language and extended descriptions, with longer sentences and a wide range of unfamiliar terms. Inspire a love of reading with Collins’s award-winning progressive reading scheme! The Collins Big Cat series is carefully graded to match Book Band levels, and includes a lively breadth of text types to suit different tastes and learning styles. 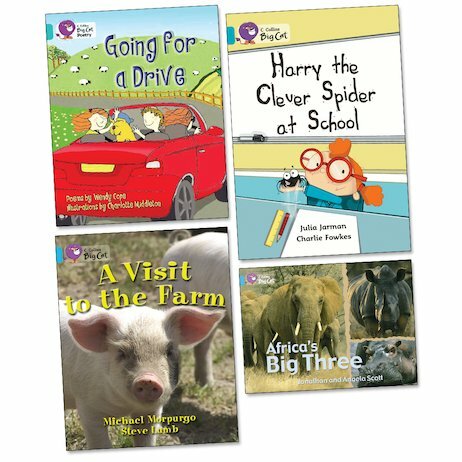 Each pack includes two fiction books and two non-fiction books, covering a wide range of text types such as stories with familiar settings, novels, poetry books, playscripts, non-fiction recounts, reports, instructional texts and more. The huge variety of subjects, voices and visual styles offers readers the choice and interest they might expect when browsing at the bookshop or library – perfect for motivating children and building their appetite for more!